Over-the-top (OTT) video is changing the way consumers view video content, contributing to a rise in the use of connected TV devices and a decline in the number of pay TV viewers. eMarketer estimates that there will be 193.3 million US OTT video service users in 2017, of which 76.2% will use a subscription OTT service at least once per month. Growing demand for OTT video content is a major driver of connected TV uptake in the US. eMarketer projects that there will be 168.1 million US connected TV users in 2017, of which nearly half (48.3%) will use a smart TV. Streaming devices, particularly those from Amazon, Google and Roku, will also gain users throughout the forecast period. US OTT video viewer penetration will approach three-quarters of internet users by the end of the forecast period in 2021. YouTube is the leader in the overall OTT category, though subscription-based services, including Amazon Video, Netflix and Hulu, are growing at a faster rate. 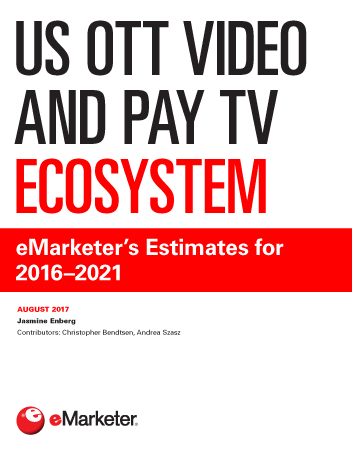 For the first time, eMarketer’s forecast includes estimates for the number of subscription OTT video service users. We predict that 76.2% of total OTT video service users will watch video on a paid subscription-based OTT service in 2017—a figure that will reach 78.6% in 2021. The number of US pay TV viewers is declining as the number of OTT video viewers rises, though of course these is overlap between the two groups. eMarketer estimates that the proportion of US adults with a pay TV subscription will fall from 77.6% in 2017 to 69.2% by the end of 2021. Cord-cutters are the biggest contributor to growth in the number of pay TV nonviewers in the US. This year, the number of adults who have canceled their pay TV subscription will climb by 33.2% to reach 22.2 million. "For the first time in 2017, more than three-quarters (76.2%) of US OTT video service users will use a subscription OTT video service at least once per month. By the end of 2021, that figure will reach 78.6%, or 164.6 million people."